Kizzycocoa – A week or so before this page has gone up, I stumbled across a very unique and interesting observation of why Purple Guy seems so different in his early years, and why he changes appearance during his later years. A Reddit user by the name of “Doowopasaurus” posted This Reddit thread, entitled “The Silver Eyes killed whatever was left of the Pink Guy theory.”. I do not believe in the two killer theory myself, as it would make no sense for the children to be put to piece at the end of FNaF3, if the Pink Guy existed. The Pink Guy would have been the one to kill the children who possessed the pre-withered suits, so killing Purple Guy would have had no affect on their finding peace. However, I don’t particularly have any interest in this particular point of his theory. My main interest is the curious links that explain the colour and body shift of The Purple Guy. Here is the image used in the Reddit post. This is actually quite relevant, and very likely the main reason for the style difference. Consider the style difference. Purple Guy kills the puppet, then kills the 5 kids who go on to possess the pre-withered suits, including the Golden Freddy suit. He gets away with the first murder, but with the second, he gets caught. however, the bodies are never found, and so the police cannot hold him, hence his reappearance in the later games. 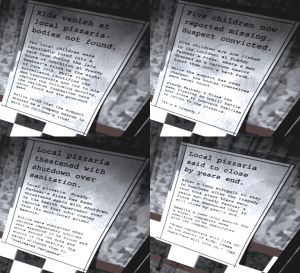 This story is told via the FnaF1 newspaper clippings. This is the base storyline in the main games. 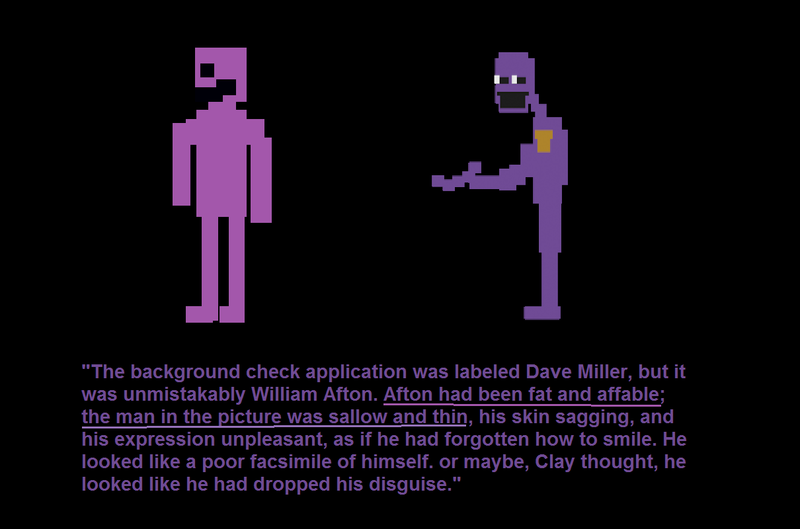 Some parts have little basis, such as the chance someone was framed instead of Purple Guy being caught, but the story follows the same lines. At this time in the books, Purple Guy sheds his fatty, happy persona. From there, he takes on a grim, shallow-face and skinny figure. But this also takes place in the games. 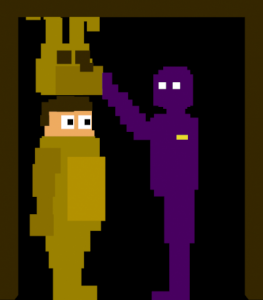 Fredbear’s, which is canonically after the first location’s lifespan, but before FNaF2, employs The Purple Guy. Not only that, but he is purple, tall and dons the glowing white eyes. This location came after the first location, due to the rumours of the first set of deaths. But it also has to take place before the FNaF2 location, as the Fredbear location was closed two years prior to the FNaF2 location’s short timespan. This is the definite place where Purple Guy changes. He changes between the murder of the five children, and Fredbear’s. But, the book has an explanation for this, and it further explains how Purple Guy gains access to the second Freddy Fazbear’s Pizza location. The book states that after being caught for the first set of murders, he drops the facade, assumes a new name, changes his appearance and then works at Fredbear’s Family Diner, as shown by his badge. Beyond this, in the games, his appearance is always dark purple, with white gleaming eyes. Once Fredbear’s is bought out, the Purple Guy then moves on to the second location, and eventually murder even more children, but gets away with it yet again. 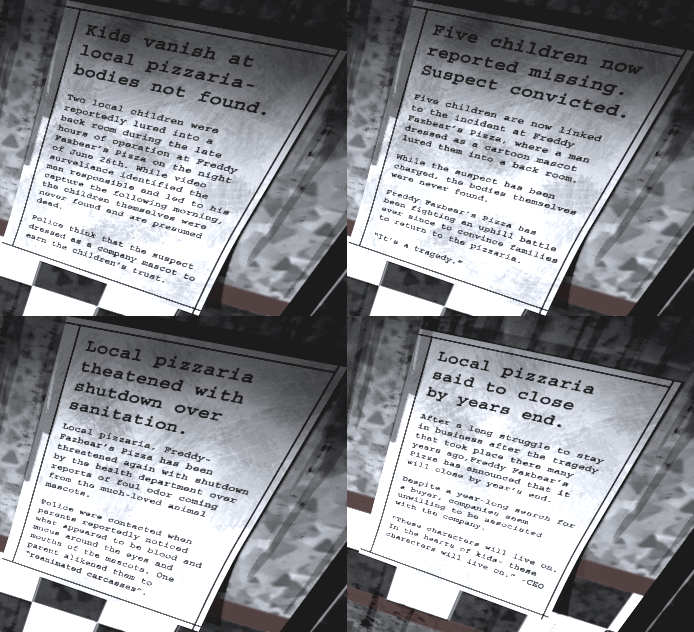 We can see the bodies are strewn around the building in the minigames, but this time, the location does not close. There is no second newspaper clipping for November of 1987, and the incident is never covered. While this is off the topic, it is notable that one of the cameras show a very strange wet floor sign, showing that someone has been cleaning floors during the restaurant’s short lifespan. Perhaps cleaning blood? In any case, this theory, as well as the newspaper clippings in FNaF1 and all of the minigames present a strong argument as to why Purple Guy changes appearance between his first set of murders, and the Fredbear location, which was the point presented. But I personally see this as a much better piece of proof that the Fredbear location was open beyond the first location that was left to rot. It does rely heavily on the book’s canon, which is not completely in line with game canon. However, several elements are cross-canonical, and I believe this is one such element. I would once again like to thank “Doowopasaurus“, who posted the original Reddit thread. It’s presented a strong case to explain why Purple Guy changes, and helps to solidify the minigames of FNaF4 in the timeline. I personally believe this explanation to be true, and it’s an interesting thought that Scott did differentiate. There must have been a reason, and I believe this is it.